This month my Secret Recipe Club assignment is Little Bit of Everything. Julie lives in the midwest and loves to cook, travel and garden. She also collects cookbooks and spoons- Fun collections! Roasted Kale and Arugula Salad really appealed to me, and how about Honey Cinnamon Creme Brulee, yum! Ultimately I decided on Pumpkin Oatmeal, it sounded so perfect for cool fall mornings…which I am still waiting for…but I’ll be ready when they arrive!! 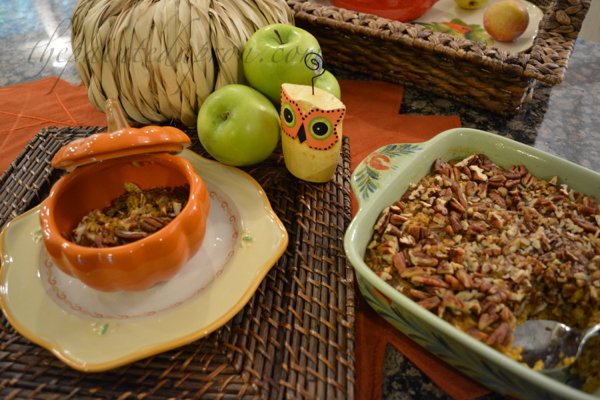 Any way you chose to serve it, it will be a welcome fall breakfast! 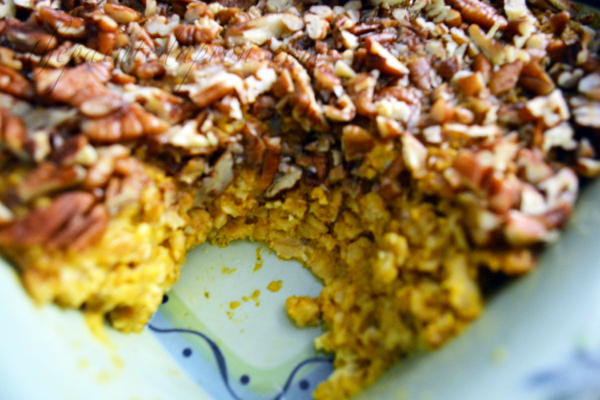 Combine oats with pumpkin pie spice, salt and baking powder in a large bowl. 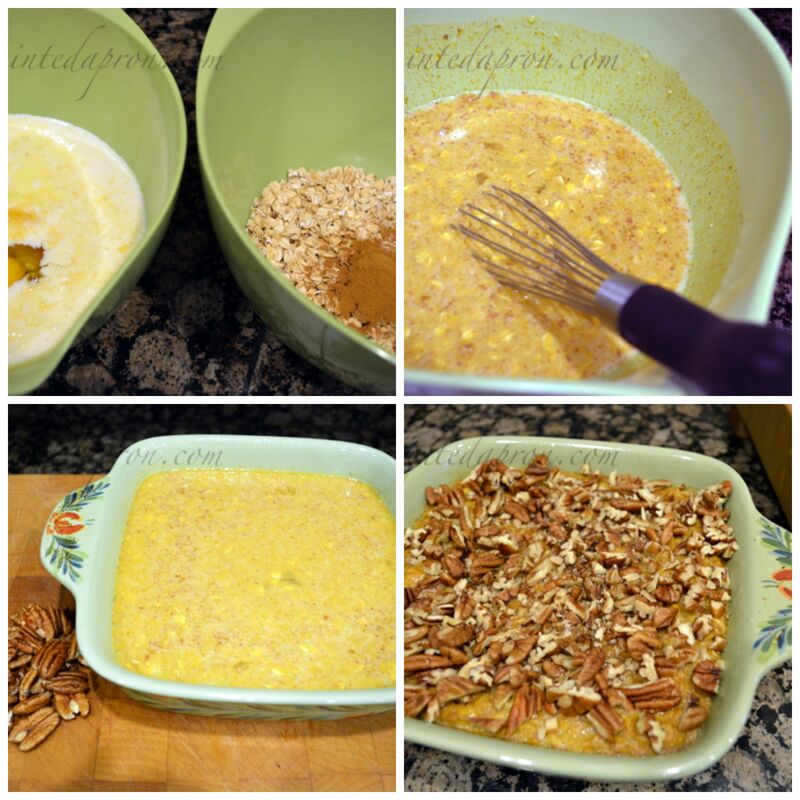 In another large bowl combine pumpkin, milk, eggs, syrup and butter. Add wet ingredients to dry and mix. Pour into a greased 1 quart casserole dish. Bake for 20 minutes. 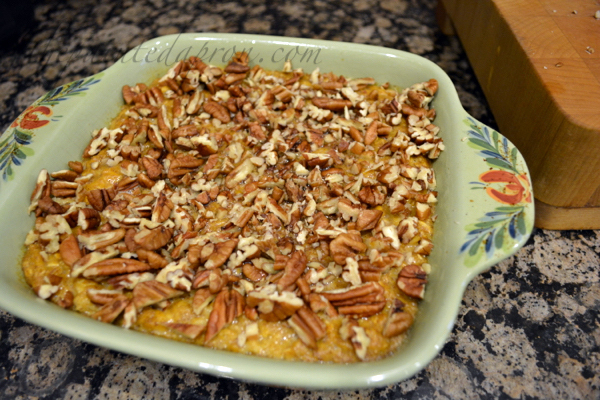 Remove from oven and top with pecans and brown sugar. Return to oven and bake another 20 minutes or until set. Makes 6-8 servings. Can be made ahead and reheated. Thank you for a great recipe Julie! Love your pictures! This sounds wonderful!! Glad you enjoyed it. 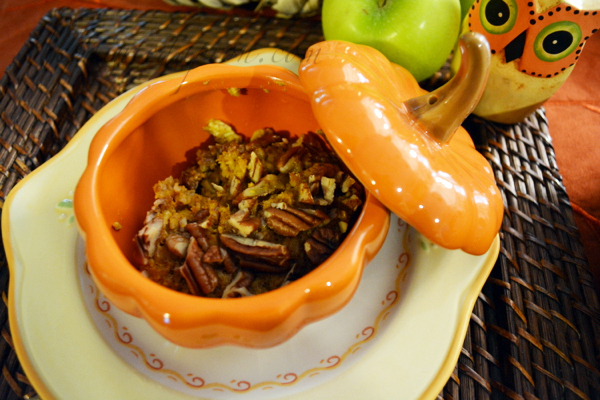 Love your pumpkin dishes! Yummy! Bring in the Fall! 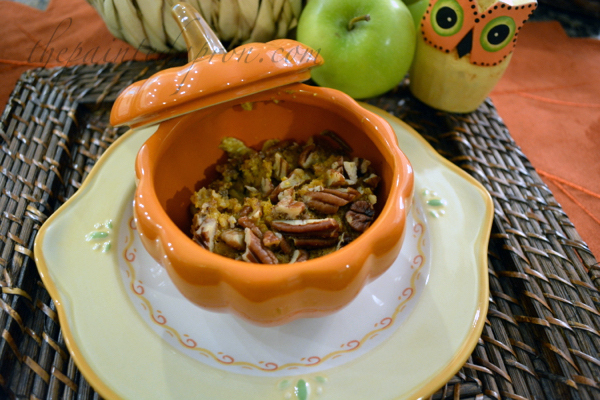 Love oatmeal, pumpkin and pecans! Perfect marriage! Wow, what a great combination of flavors! I’ve also combined actual slices of pie with my morning oatmeal. Love them both! Looks so good! Love the bowls and presentation, Jenna! 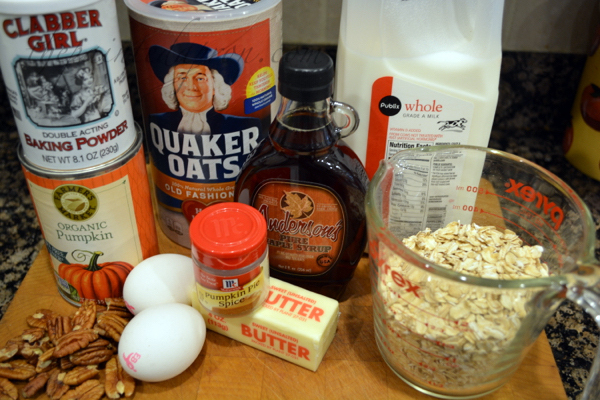 I love oatmeal and this recipe sounds especially delicious! Wow this looks amazing and sounds delicious. We love having you and I hope you enjoy the week. This sounds like a fabulous Fall breakfast, Jenna! I can just about smell the delicious aroma. I must make some of this soon! I’m still waiting on Fall to arrive, too. Yum, I love anything that has to do with pumpkin. This is the perfect Fall breakfast. What a perfect way to start the day. I love fall just because of the pumpkin delights everywhere. Thanks for sharing. LOVE the little pumpkin bowl. i LOVE that pumpkin dish! so cute!! and pumpkin oats are always a great choice. 🙂 yum! nice src post!